When I opened my freezer for the first time after the trip, I knew that I need to make an effort to clean it up. I have frozen berries from red/white currants, black currant, raspberries, strawberries, blackberries, blueberries, yellow raspberries, you name it, it is crazy. I had some white chocolate mousse that I have put in a mold and ready to be used up in a cake, everything is in there. Now that Summer is getting really close, I definitely need to clean that up before stocking up again for the next winter time. Since I haven't gotten around to download the new cake pictures from the camera yet, I will start by posting the one I made from last year before I left on my trip, in no particular order (I have A LOT). As you've probably know, I am a big fan of Pierre Herme's lemon cream and I had been thinking of making the passion fruit version of that. Passion fruit is probably my favorite tropical fruit (same level as mango), something about the bright taste just reminds me of sun in tropical paradise. Anyways, so I was trying to use up some of the ingredients in my freezer (which I still need to do) before I left for months, and I found tart dough sitting in the back of my freezer. I thought this was perfect to make the passion fruit tart I've been wanting to make. 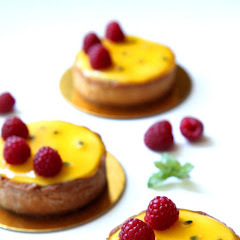 Pierre Herme and Laduree have a recipe for their passion fruit and raspberry tart. 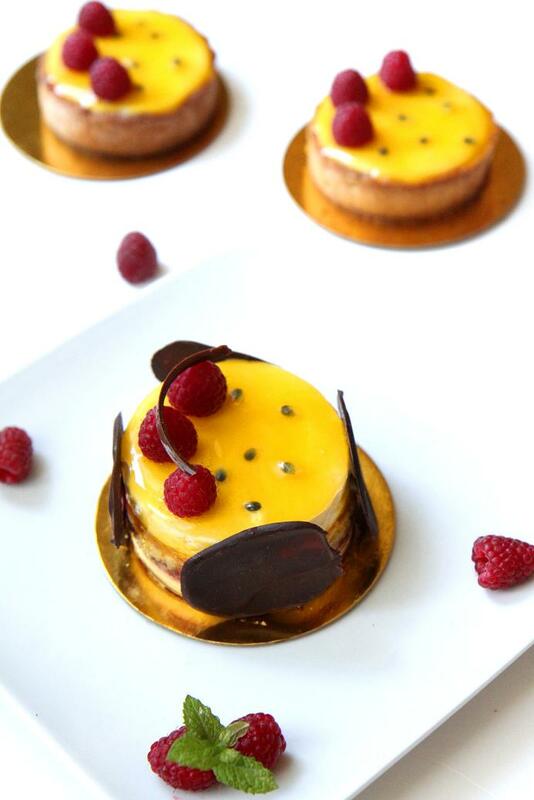 Pierre's version has a layer of thin genoise and raspberry jam in the bottom, while laduree does not. 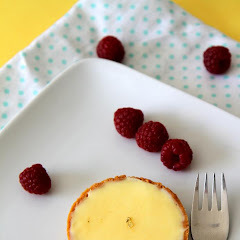 Instead, Laduree's version has fresh raspberries on top of the tart, which one of my favorite blogger, Evan, tried in her blog and she made it as beautiful as the book does. The recipe for the passion fruit cream is similar, both has huge amount of butter that you blend at the end. 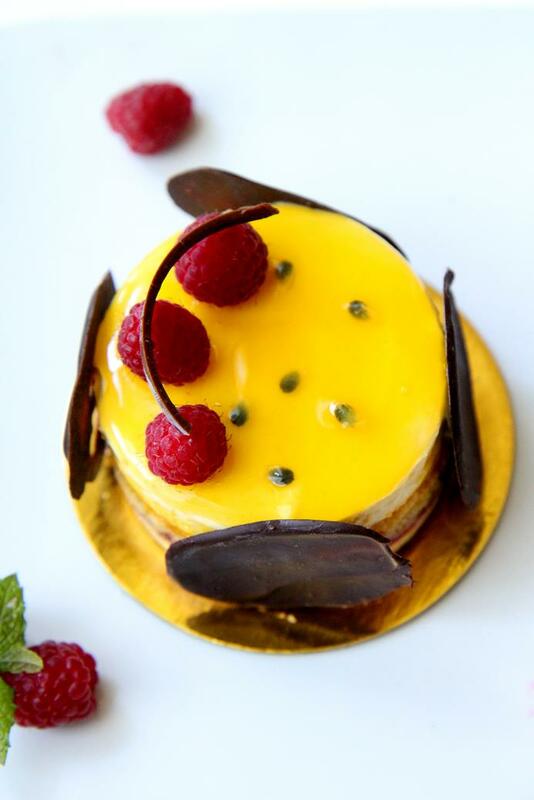 It is not really surprising since Pierre used to work at Laduree before opening his own shop, so you would find similar desserts between the two. I decided to go with Pierre's version by adding thin genoise and raspberry jam layer in the middle. I didn't use his genoise recipe though, I used some joconde I had available at that time and I made simple raspberry jelly. I wanted to make a mini version of the tart, I've always liked mini everything as I think it is prettier. 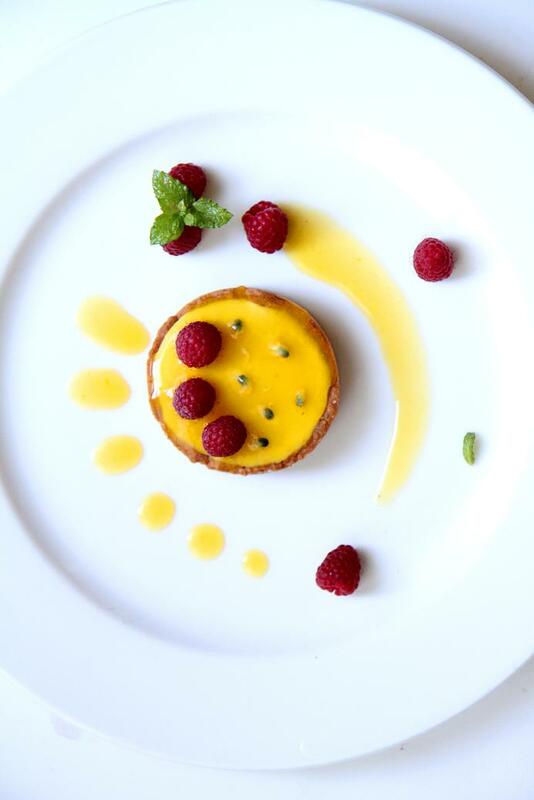 The tart dough I had was from Pierre Herme recipe, same one as I used in this lemon tart. I used the same recipe for the passion fruit cream, just substituted passion fruit for the lemon. As expected, the resulting cream is bursting with passion fruit flavor and as smooth as it can be. I made the leftover joconde and cream and raspberry jelly to make the cake version of it and it is equally good! Speaking of Pierre Herme and Laduree, look where I went to and what I got on my Japan visit!! I was literally jumping up and down when I was finally there . Too bad the Pierre Herme store I went to, didn't have a complete selection but I was happy enough to try his famous Ispahan among everything else (I had the regular size of Ispahan but can't find the picture). It didn't stop us from coming back the second time though. Laduree however, it didn't look like an ordinary bakery, it is a boutique! It is also the most expensive one among everything else. Everthing in it, the decor, the place, seemed really Parisian and upscale. We definitely feel like a queen there. I would hope so when I am paying $15 for a small piece of cake, and more than $10 for 2 scoops of ice cream. We were always seated by the window overlooking the famous high-end Ginza shopping district. We also went to Sadaharu Aoki, no less than 3x in a week.I also found Toshi Yoroizuka by surprise. Nonetheless, the week I had in Japan was full of gourmet concoctions. I can't upload all of my food pictures, but there are TONS of these kind of goodies! It was an amazing week we had in Japan.I finally got to cross off one item in my bucket list, which is visiting Japan during the cherry blossom season, and let me tell you, it was AMAZING! Japan is amazing, from the people, the food (oh the food was definitely memorable), the culture, everything was great, except the fact that it is also expensive. Will definitely go back there one of these days. In the meantime, I will leave you with the recipe for passion fruit tart. 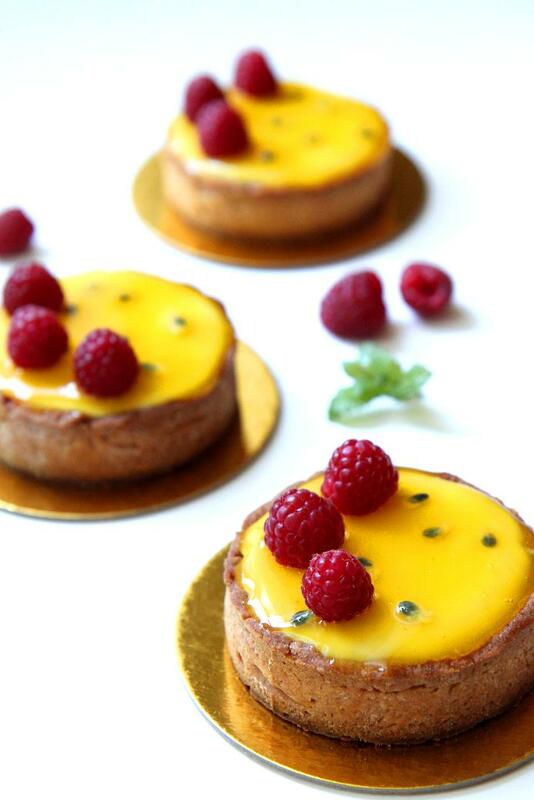 You can omit the joconde and raspberry jelly, and just made a passionfruit tart, maybe with some raspberries on top. Have a happy Summer! Mix the eggs, sugar, passion fruit pulp, and lemon juice and cook in a bain-marie, making sure that the bottom of the bowl doesnt touch the hot water underneath. Stir/whisk constantly until the mixture thickens and reach 85-86C. Strain the mixture and let cool to about 55-60 C and put it in a blender (if you don't have a hand-held blender). Add the butter a couple of pieces at a time, to make an emulsion. The mixture will lighten in color. Continue running the blender for a few minutes after all of the butter has been added to ensure the airy and light cream. Make sure stop and run the blender a few times to avoid over-heating. · Combine the water, zests, and vanilla pod/seeds and heat it to 45 F.
· Add the sugar and the pectin. Bring to a boil for about 2 minutes. · Remove from the heat, add the lemon juice and mint leaves. · Leave in infusion for 30 minutes in room temperature, and run through a fine sieve. So funny, I have been in Paris last week, and our favourite places were Pierre Hermé, Ladurée and AOKI. Same obsession in different places!! omg this looks too yummy!!! hi, how many ml is the passion fruit puree with pulp if want to make passion fruit glaze? and may i know which pierre herme book ? Anonymous: I didn't measure the amount of passion fruit pulp. I just add it a little at a time until I got the taste I wanted. 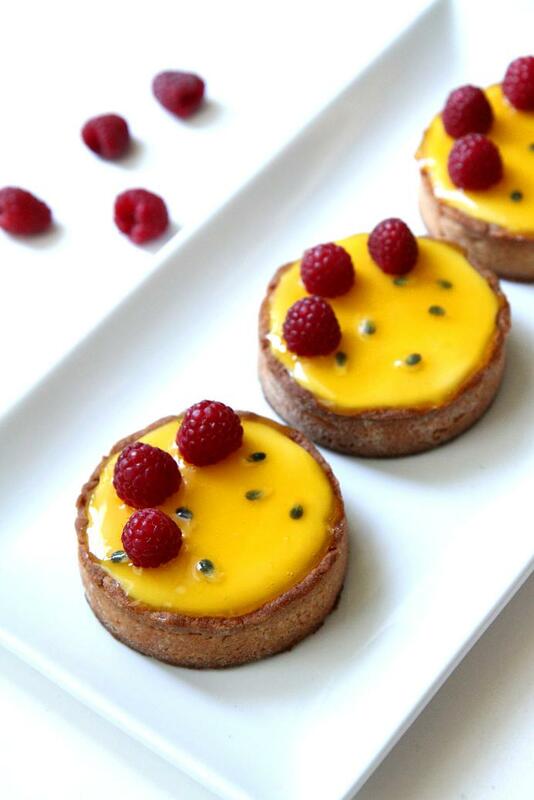 hi…using the pastry and filling recipe you provide, how many mini-tarts can i make? …..hello, can you tell me how many mini-tarts you can make with this recipe?……thanks! Anonymous: You will have leftover with the tart dough, but you can freeze it for later use. For the filling, using my mini molds, it makes about 12-14 mini tarts. 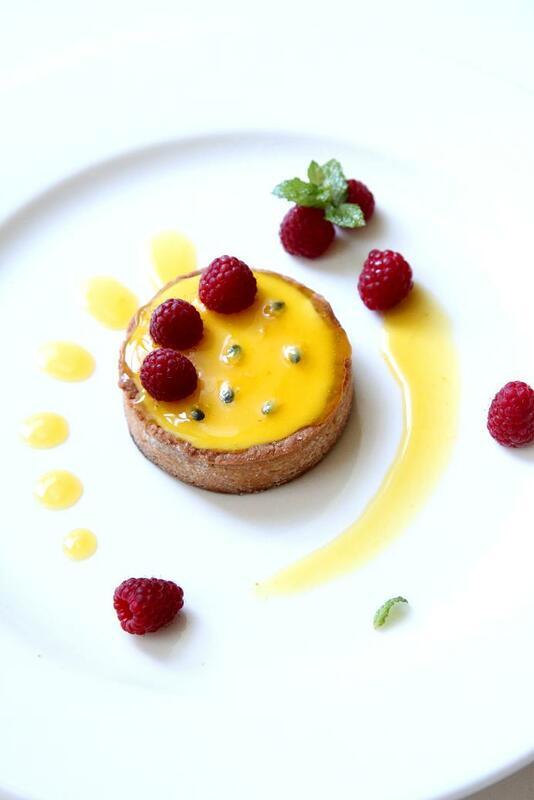 Thank you for this delicious recipe - the passion fruit was an inspired choice! I have a question - I've never made a tart like this before, so excuse my ignorance...after I've baked and cooled the tart shell (done), I've made the passion fruit filling (done), and the glaze (done)....how do I assemble them? Obviously I should pour the cream into the tart, but then do I bake it? Or will it harden in the fridge or something? Thank you! Thanks again for the recipe. Meredith: Yes, pour the cream into the tart shell. If the cream has cooled and set, stir it until it is creamy again before filling the tart shell with it. No need to be baked again, just put it in the fridge to set. OMG is the passion fruit crème perfect! Thank you. Bertha what pans do you use? All I can find on Amazon are muffin circles which would work but they are so much shorter than yours. Thanks! You have a great website on. Loving all the recipes and photos. 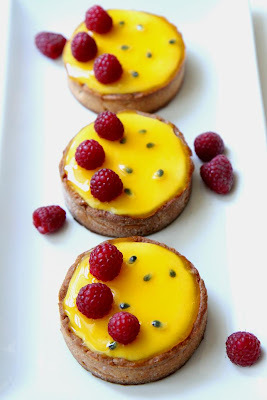 I am thinking about making these tarts and I was wondering if they were freezeable. 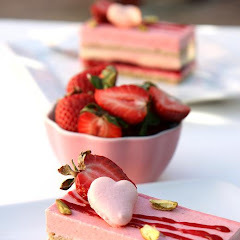 A Amazing Tart: I have not tried freezing it, but I wouldn't recommend it. The translucent glaze will crack if you freeze and thaw it. I would also imagine that the tart crust will be soggy after thawing. I am not 100% sure though since I never tried it. Love the recipe in general but are you sure about the amount of butter in cream? I followed the recipe to the word but ended up what feels like a flavored butter. The cream before adding the butter was amazing! Maybe my palate is looking for less buttery but I would have been much happier with 1/4th of the butter. Anonymous: Yes, it does use A LOT of butter to get a really creamy consistency. You can reduce the amount of butter, but the resulting cream at the end will not be as thick, but it depends on people's preference of course. Thanks for trying the recipe! Anonymous: The creamy butter consistency is actually what we're after :), but each to their own. If you prefer the non-creamy consistency, you can certainly reduce the butter by a lot (as you would with common curd) and just make the passionfruit curd without blending the room temperature butter. Hi Bertha, I just stumbled on your blog and I’m really loving it! I have a few questions as I’m interested in making these for a special event. Also how far ahead can you assemble the whole tart? And finally, I’m not sure if I can find Pectin where I live. Can gelatine be used and what dosage? So sorry for all the questions, I tend to overthink things a little too much 😊. I was reading a previous comment about the amount of butter added and was wondering if there was a way to add less butter without changing the consistency perhaps by mixing a thickener such as cornstarch? Also I’m a little crunched on time. How far ahead can I assemble the pie and should it be refrigerated until serving time? Finally is there any substitute for pectin that I could use? Would really appreciate the feedback as I want to make this for an upcoming event. Anonymous: This is a very buttery tart, so you should expect it to be buttery. I once reduced the butter to 200g (from 300g) and still got the similar consistency, maybe a bit runnier as expected. Good luck and hope you like it!